A nebishy bank clerk puts on a mask containing the essence of the Norse trickster god Loki, or some similar sort of mystical troublemaker, and acquires all the powers of a Tex Avery cartoon character. If you’re familiar with Tex Avery cartoons, you will realize that this makes him the most invincible superhero imaginable. Of all the roles of Jim Carrey’s career, this has got to be the Jim Carreyest ever. Meaning that even when he’s playing Stanley Ipkiss in full nebish mode, he’s still Tex Avery-like compared to a normal person. The film co-stars a prosthetically enhanced Cameron Diaz as Jessica Rabbit. And they’ve got Ben Stein in here as a Doctor of Maskology. 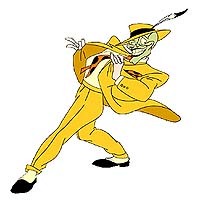 And some cool swing tunes, because the Mask is a hep cat. The whole thing is done with a look and style that keeps one foot in the big band era. As you no doubt know, Cameron Diaz has a knack for comedy, and though her role here is pretty much stuck on the straight-woman side of the jokes, her scenes nevertheless bring a good share of comedic energy to the story, and some very believable and likeable acting. Amazingly, she had no previous acting experience when she did this role. So yeah, no surprise that she turns out to be a big star. Peter Greene as the bad guy was also pretty much a new face then, and he makes an excellent scary villain, someone who’d feel right at home in a serious gangster flick. Oh, and Stanley Ipkiss’s dog is one of the coolest movie dogs ever. The Mask doesn’t set out to fight Communism, he just runs afoul of criminals through accident and impulsiveness. And then... one cool thing about this movie is that not only is it a pretty funny specimen of slapstick comedy, but the crime plot brings out a true heroic side of the protagonist. This is something that many action movies do not do nearly as well — they don’t realize the big difference between being tough and being brave. It’s also neat how the movie turns “good girl” and “bad girl” clichés upside down. I wish they hadn’t cut out the scene where the bad girl meets a hilariously appropriate end. They probably wussed out because she didn’t “deserve” it enough. Hey, the workings of real life have nothing to do with whether you deserve anything... making movie stories work according to ideas of who deserves what just might be the biggest overall lie that Hollywood tells.